The Target Saver: Buffalo Plaid Tunic :Was $49.99 - Now $24.99 + Free Shipping! Buffalo Plaid Tunic :Was $49.99 - Now $24.99 + Free Shipping! Today thru Tuesday 9/4 , you can grab this Buffalo Plaid Tunic from Jane.com for just $24.99 shipped (reg. $49.99)! 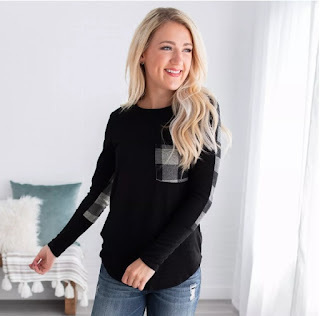 From the plaid design on the back and front pocket, to the long sleeves, to the slimming semi-loose fit, you can trust when we say our tunic is a must-have this season! These tunics are made from the softest fabric and is comfy and cozy, but also a more lightweight top, perfect for all your adventures all season long! Sizes range from Small, Medium & Large. Comes in red or grey! Offer ends Tuesday, 9/04.